There are many myths about oral health that are believed far and wide. We’ve done our research to help put them to rest. How many of these “mouth myths” have you believed? This widely-held belief is really only partially true. Despite what your mother may have told you, sugar doesn’t “rot your teeth.” Cavities are really caused by bacteria living in your mouth that secrete acid that eats away at your teeth, leading to decay. And what do these bacteria love to eat? You guessed it–sugar! It’s not the amount of sugar we eat that makes the difference, but rather the amount of time the bacteria have to secrete their harmful acid after consuming the sugar we eat. These sugars include not only candy and sweet drinks, but also naturally-occurring sugars in bread, fruit, beans, and even potatoes too! The best solution, of course, is to brush after eating sugary snacks to remove the harmful bacteria as well as the sugars they feed on. 2. Diet soda is better for my teeth. If sugar feeds those nasty cavity bugs, then sugar-free soda is better for your teeth, right? Not exactly. Sodas, sports drinks and citrus beverages are high in acid–the very thing that eats away at tooth enamel, making them more vulnerable to decay. The best drink for your teeth is simple tap water (with fluoride!) If you do consume an acidic drink it’s better to wait to brush. Since the acid softens your enamel, brushing right after consuming an acidic beverage will only make the erosion worse. Instead, swish with water to remove the acid and wait until later to brush. 3. Baby teeth aren’t important. Of all the oral health myths that abound, this is probably the worst! A young child’s teeth can not be neglected simply because they will eventually be replaced. Not only are teeth essential for chewing and speaking, but cavities hurt! And children who are not taught to care for their teeth at a young age are unlikely to adopt proper oral health habits later in life. 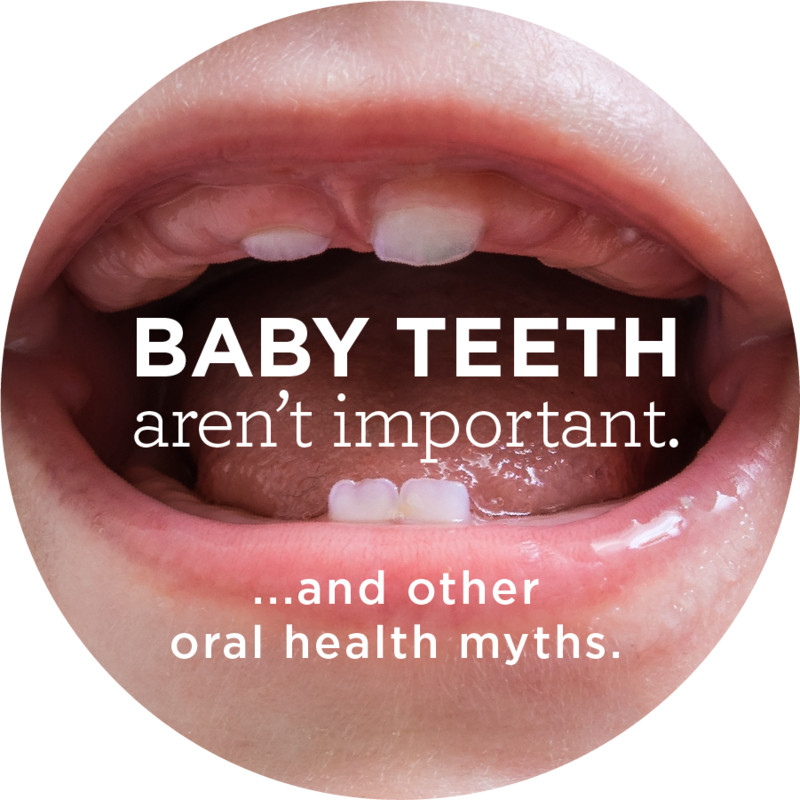 Read more about the importance of baby teeth here. The truth is, proper oral care begins at birth. Wipe your baby’s mouth after every feeding using a soft cloth. This not only removes bacteria, but it gets the baby used to the sensation of having their mouths cleaned. Then, when the baby’s first tooth erupts, begin regular dental visits and brush with a smear of toothpaste with a soft-bristled brush. Don’t expose your baby to the harmful bacteria in your own mouth by “cleaning” their pacifier with your mouth, sharing utensils or blowing on their food to cool it. 4. Chewing sugar-free gum is as good as brushing. Don’t mistake minty-freshness as cleanliness. While chewing gum may make your mouth feel clean and can help produce saliva that helps to neutralize acid, it doesn’t hold a candle to brushing. Chewing gum may be helpful in a pinch (and is certainly better than nothing), but never skip brushing in favor of chewing gum. 5. Fluoride is an artificial chemical and, therefore, dangerous. In this age of “all-natural” and organic lifestyles, some people have grown wary of fluoridated water and oral health products that contain fluoride. However, fluoride is a naturally-occurring substance found in many water supplies. Only when supplies are deficient does the need for adjusted fluoridation arise. Fluoride is effective in preventing decay and is safe to consume. For more information, visit the American Dental Association website. 6. You shouldn’t have dental work done during pregnancy. While pregnancy can make it harder to get to the dentist, with all those other doctor appointments that must be kept, it is important not to neglect your oral health‒especially your gums! Gum disease has been linked to preterm birth, and changes in hormone levels can cause swelling and bleeding that can lead to infections in the gums. Be sure to visit your dentist for routine cleanings. For more information on the safety of dental procedures while pregnant, click here. We hope you learned something new–if not, you're already an oral health expert! Be sure to share this with your friends on social media so they can be too!